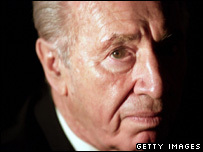 Veteran Israeli politician Shimon Peres has quit the Labour Party and announced his support for his long-time rival, Prime Minister Ariel Sharon. Mr Peres said he had taken the difficult decision because Mr Sharon was the person with the best chance of forging peace with the Palestinians. Mr Peres, 82, did not say whether he would join Mr Sharon's new Kadima party ahead of Israel's election in March. Mr Peres lost the Labour leadership in a contest earlier this month. Trade union leader Amir Peretz has succeeded him at the helm of Labour. Mr Peres has stood for his party's leadership on and off for the last three decades. Mr Sharon formed his centrist party early this month after quitting the governing right-of-centre Likud he helped establish in 1973. Even if he does not join Kadima, Mr Peres is expected to campaign for Mr Sharon and to be offered a cabinet post if the prime minister remains in power after the election, says the BBC's Matt Prodger in Jerusalem. "My period of service within the [Labour] party has come to an end," Mr Peres told a press conference in Tel Aviv. The former prime minister said he would "dedicate the next years to the supreme effort to making peace between our neighbours and us, while keeping peace within us". "His [Sharon's] mind is set to continue the peace process and he is open to new ideas for peace. I support his election to seek these aims." Several opinion polls in Israeli newspapers have suggested that Kadima, the Hebrew word for "forward", could win the election. On Tuesday, an ally of Mr Sharon's in Kadima, Meir Sheetrit, said the party would try to reach a final status agreement with the Palestinians in its first term in power. Our correspondent says Mr Peres' defection from Labour is likely to strengthen the centre ground in Israeli politics. Mr Peres said his decision to leave Labour - the party that has been his political home for decades - had not been an easy one. "My concern is deep and my hope is high," he said, pointing to threats to Israeli security from Iran and from "fanatical terrorism". 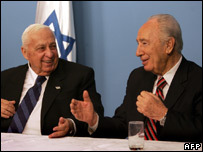 Mr Peres has supported Mr Sharon in the recent past. As leader of the Labour Party, Mr Peres allied with Mr Sharon to help him overcome parliamentary opposition to withdrawing soldiers and settlers from the Gaza Strip earlier this year.